Images used on websites and in ebooks should be compressed. Compressed does not mean reduced in size, however. 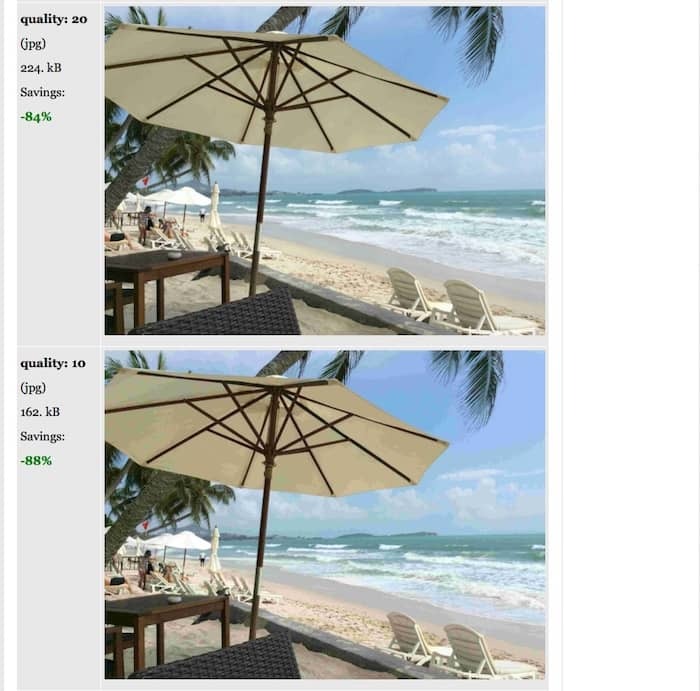 When an image is compressed, it retains its physical dimensions, but it is stripped of its embedded data, and the resolution and quality are both lowered to reduce the file size. As with all things Internet, including ebooks, smaller file sizes make for faster websites and transfer speeds. If you are publishing on Amazon Kindle and use images in your ebooks, large image files will increase your overall ebook file size. You are charged for ebook delivery by Amazon, so be aware that large ebook file sizes will quickly eat away at your royalty. The key to image compression is to find the right balance between image quality and file size to suit where the image will appear. For a website, an image does not need to be of high quality and resolution, but it still needs to be sharp and clear. For an ebook, consider that it is unlikely that your ebook will be read on a high-definition device. A Kindle ebook reader is certainly not, and many models are only black and white, so again, high resolution is definitely not necessary. How to compress an image. Before compressing an image, the most important step is to change the physical dimensions of the image to suit where it is going to be used. First, make a copy of your image so you can keep the original. Then you can use Preview on an Apple or Paint on a PC to resize the copied image to the size and resolution you want. Save your resized image. There are many ways to compress a jpeg image or png images online, and a quick Google search will find a lot of free sites that mostly work very well. I will use Online Image Optimizer as an example here. My original image is nearly 1.4 megabytes, which is far too big for online use. 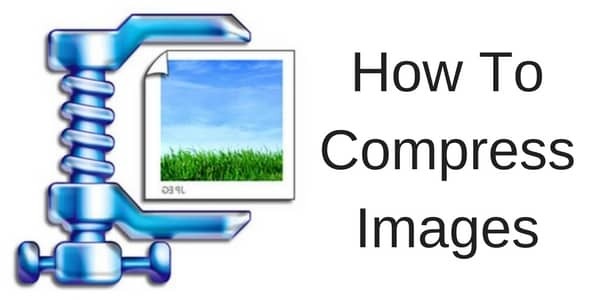 So let’s look at how to use lossy compression to compress the image size and make it suitable to use on a website or in an ebook. More Reading: How to check your blog site speed. 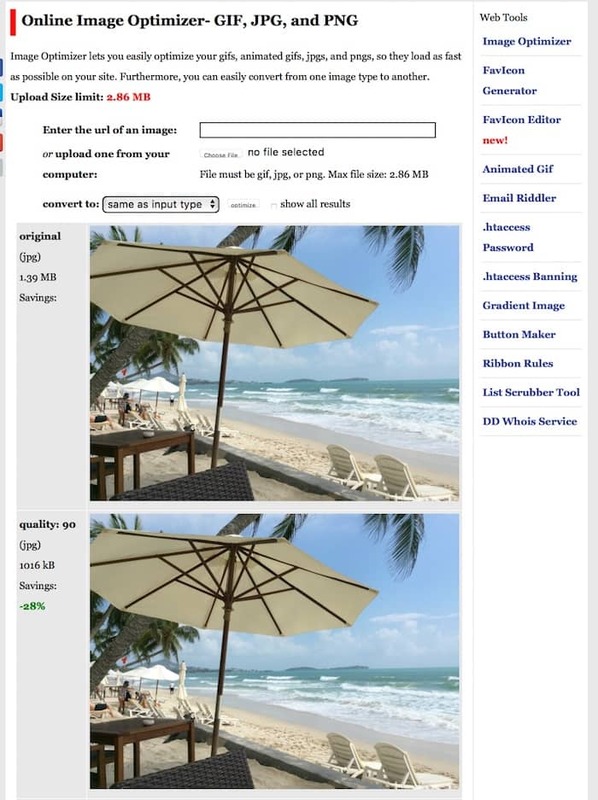 Depending on the intended use, the last three optimized images still retain enough visual quality to be used for most online applications, while saving over 80% on the file size. However, in the last image, it is noticeable that the quality is starting to deteriorate. I would select the third from last. All I need to do is right click on my selected image, and download. That’s it. I now have my image at a fraction of its original size, but without any visible loss of quality. 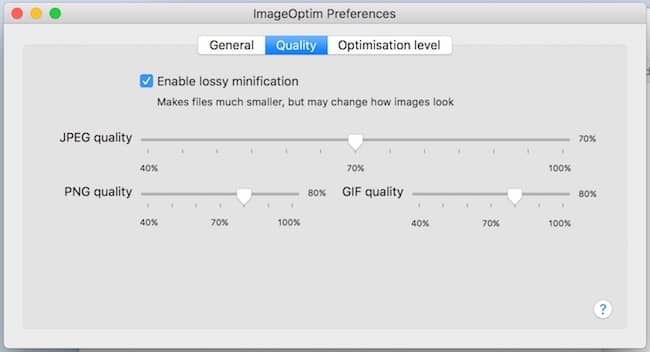 If you have an Apple computer, another quick and easy means of compressing an image is to use a free application, ImageOptim. It is a drag and drop application, and the settings can be adjusted to suit any level of compression. Image compression is quick and easy, and saves on bandwidth, increases webpage loading speed and for ebooks, reduces delivery charges by Amazon Kindle. All very good reasons to learn how to, and make a habit of compressing all of your online and ebook images. For all my images that are too be added to my websites or ebooks, I use ImageOptim because it is so quick and easy. You can see my settings for it in the image above. But I have one more tool to compress images even more for my websites. WP Smush It is a WordPress plugin that reduces images automatically on upload. 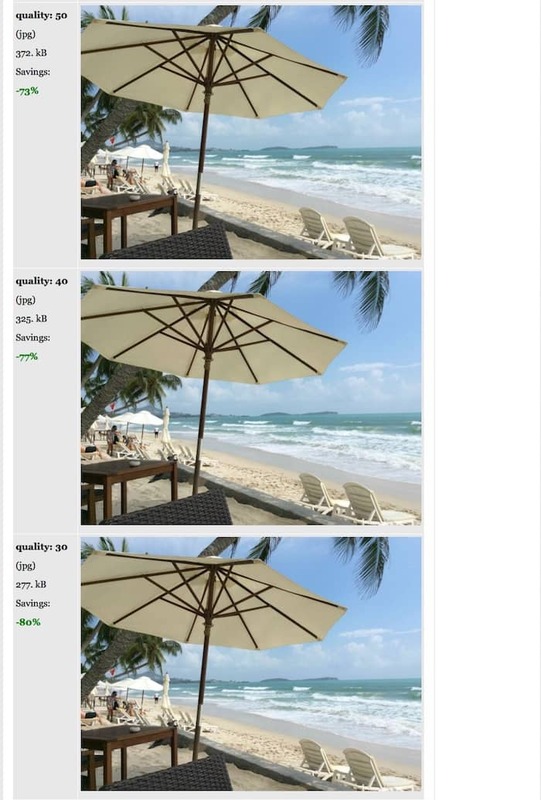 While it doesn’t do as good a job as ImageOptim by itself, it helps by reducing my already compressed images just a little bit more, without any quality loss, which ensures that my website pages will load lightning fast. If you only want a compressed version of your book cover to use on your website, go to your book’s Amazon page and right-click on your book cover image and download it. You will get a fully compressed version because Amazon has done all the compression work for you.